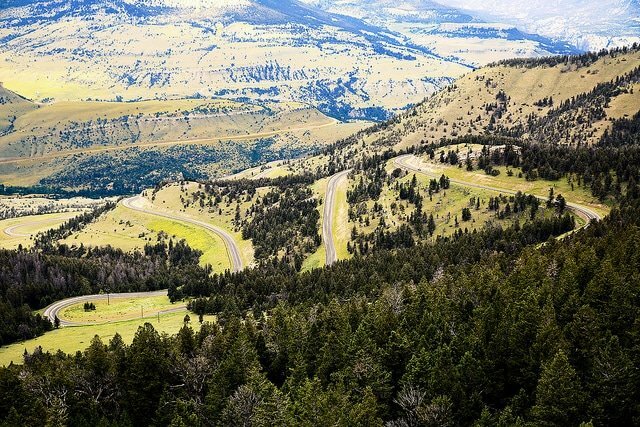 The road on north side of Dead Indian Hill on the Chief Joseph Highway near Cody, Wyoming Copyright by WyoJones. All rights reserved. Used with permission. When we were kids, we loved going up the mountains. When it was time to head down the switchbacks, my dad would let us out to “race” him down. We’d cut straight down through the brush. It was a good way to burn off the last of our energy before we got home. Going up, or coming down, we weren’t in a hurry. Switchbacks must be taken slowly, because of the hairpin turns, but they also help when ascending and descending steep mountains. Life has terrain that can be taken quickly—well it can when one is young. But when the climb is steep, switchbacks are your friend. And the views are amazing if you dare to look away from the road—or pull over to just take it in. On this Monday morning, while we’re flinging ourselves at the week’s obstacles, perhaps pause to consider it. Is it a bump or a mountain? And if it is a mountain, maybe look for the switchbacks to get you up. And don’t forget to look around.